Get a helper for your blow dryer with got2b, Osis+ and Garnier Fructis! got2b Rise 'N Shine Glistening Full Blow Dry Cream - 147ml - $8.99 - offers high-heat protection, static control, glamourous fullness and glistening shine without weighting hair down - not only does it protect from heat but it will also shorten drying time - for shiny, fluffy hair even sooner! Available now at dry and mass retailers across Canada including Shoppers Drug Mart, Pharma Plus, Walmart, Loblaws and Jean Coutu. Schwarzkopf Professional Osis+ Blow & Go Smooth Express Blow-Dry Spray - 200ml - $21 - with a non-sticky formula that dramatically reduces drying time while smoothing the hair and controlling frizz and fly-aways to transform frizzy, unruly hair into a sleek and elegant style. Available at professional salons across Canada. 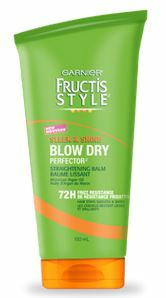 Garnier Fructis Style Sleek & Shine Blow Dry Perfector Straightening Balm - 150ml - $5.49 - just apply to towel-dried hair before blow drying to help smooth and straighten hair during the process - contains Moroccan argan oil to create a humidity-resistant barrier against frizz and sets hairstyles for up to 72 hours - for hair that looks soft and bouncy.